Natuzzi Editions Artisan/Luca/Penserio electric reclining chaise corner sofa with matching Natuzzi feature chair. 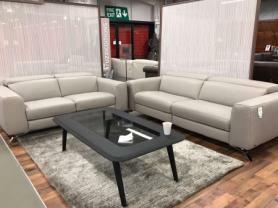 In full Italian Le Mans taupe craftsman protecta leather with stylish chrome above the floor floating legs. Features a power recliner with independent power headrest and footrest on the armside and manually adjustable headrests on the remaining seats. Superior model from Natuzzi which has independent headrest and independent recliner mechanism. Approximate Measurements: 286 cm arm side x 240cm chaise side x 107cm deep.